Under Russian federal law, the RuAF along with the Federal Security Service (FSB)'s Border Troops, the National Guard, the Ministry of Internal Affairs (MVD), the Federal Protective Service (FSO), the Foreign Intelligence Service (SVR), and EMERCOM's civil defence form Russia's military services and are under direct control of the Security Council of Russia. There are additionally two further "separate troop branches", the National Guard and the Border Service. These retain the legal status of "Armed Forces", while falling outside of the jurisdiction of the General Staff of the Armed Forces of the Russian Federation. The National Guard is formed on the basis of the former Internal Troops of Russia. The new structure has been detached from the Ministry of Internal Affairs into a separate agency, directly subordinated to the President of Russia. The Border Service is a paramilitary organization of the Federal Security Service - the country's main internal intelligence agency. Both organizations have significant wartime tasks in addition to their main peacetime activities and operate their own land, air and maritime units. The number of personnel is specified by decree of the President of Russia. On 1 January 2008, a number of 2,019,629 units, including military of 1,134,800 units, was set. In 2010 the International Institute for Strategic Studies (IISS) estimated that the Russian Armed Forces numbered about 1,027,000 active troops and in the region of 2,035,000 reserves (largely ex-conscripts). As opposed to personnel specified by decree, actual personnel numbers on the payroll was reported by the Audit Chamber of Russia as 766,000 in October 2013. As of December 2016, the armed forces are at 93 percent of the required manpower, up from 82 percent reported in December 2013. According to the Stockholm International Peace Research Institute, between 2005-2009 and 2010-2014, Russian exports of major weapons increased by 37 percent; Russia spent $66.4 billion on arms in 2015, then $69.2 billion in 2016, having taken 3rd place (after the U.S. and China). According to the Russian Defence Ministry, share of modern weapons in the Armed Forces reached from 26 to 48 percent among different kinds of troops in December 2014. This was raised to 30.5–70.7% as of July 2015. The average was 61.5 per cent over the end of 2018. The Soviet Union officially dissolved on 25 December 1991, leaving the Soviet military in limbo. For the next year and a half various attempts to keep its unity and to transform it into the military of the Commonwealth of Independent States (CIS) failed. Over time, some units stationed in the newly independent republics swore loyalty to their new national governments, while a series of treaties between the newly independent states divided up the military's assets. Apart from assuming control of the bulk of the former Soviet Internal Troops and the KGB Border Troops, seemingly the only independent defence move the new Russian government made before March 1992 involved announcing the establishment of a National Guard. Until 1995, it was planned to form at least 11 brigades numbering 3,000 to 5,000 each, with a total of no more than 100,000. National Guard military units were to be deployed in 10 regions, including in Moscow (three brigades), Leningrad (two brigades), and a number of other important cities and regions. By the end of September 1991 in Moscow the National Guard was about 15,000 strong, mostly consisting of former Soviet Armed Forces servicemen. In the end, President Yeltsin tabled a decree "On the temporary position of the Russian Guard", but it was not put into practice. After signing the Belavezha Accords on 21 December 1991, the countries of the newly formed CIS signed a protocol on the temporary appointment of Marshal of Aviation Yevgeny Shaposhnikov as Minister of Defence and commander of the armed forces in their territory, including strategic nuclear forces. On 14 February 1992 Shaposhnikov formally became Supreme Commander of the CIS Armed Forces. On 16 March 1992 a decree by Boris Yeltsin created The Armed Forces of the Russian Federation the operational control of Allied High Command and the Ministry of Defence, which was headed by President. Finally, on 7 May 1992, Yeltsin signed a decree establishing the armed forces and Yeltsin assumed the duties of the Supreme Commander. In May 1992, General Colonel Pavel Grachev became the Minister of Defence, and was made Russia's first Army General on assuming the post. By August or December 1993 CIS military structures had become CIS military cooperation structures with all real influence lost. Significant reforms were announced[by whom?] in late 2008 under Defence Minister Anatoliy Serdyukov (in office 2007-2012), and major structural reorganisation began in 2009. Key elements of the reforms announced in October 2008 included reducing the armed forces to a strength of one million by 2012 (planned end-date was 2016); reducing the number of officers; centralising officer training from 65 military schools into 10 "systemic" military training centres; reducing the size of the central command; introducing more civilian logistics and auxiliary staff; elimination of cadre-strength formations; reorganising the reserves; reorganising the army into a brigade system; and reorganising air forces into an air-base system instead of regiments. On 17 October 2012 the head of the State Duma's Defence Committee told RIA Novosti that Russia planned to boost annual defense spending by 59 percent to almost 3 trillion rubles ($83.3 billion) in 2015 up from $61 billion in 2012. "Targeted national defence spending as a percentage of GDP will amount to 3.2 percent in 2013, 3.4 percent in 2014 and 3.7 percent in 2015", Defence Committee chairman Vladimir Komoedov is quoted[by whom?] as saying in the committee's conclusion on the draft budget for 2013-2015. The schedule envisaged reducing the total numbers in the officer corps from 335 thousand to 150 thousand, but in early February 2011 Defence Minister Anatoly Serdyukov announced the decision to increase officers by 70,000 - to 220 thousand to counteract this. 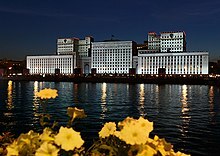 The Defence Ministry of the Russian Federation serves as the administrative body of the Armed Forces. Since Soviet times, the General Staff has acted as the main commanding and supervising body of the Russian armed forces: U.S. expert William Odom said in 1998, that 'the Soviet General Staff without the MoD is conceivable, but the MoD without the General Staff is not.' However, currently the General Staff's role is being reduced to that of the Ministry's department of strategic planning, the Minister himself, currently Sergey Shoygu may now be gaining further executive authority over the troops. Other departments include the personnel directorate as well as the Logistical Support, Railway Troops, Signal Troops and Construction Troops. The Chief of the General Staff is currently General of the Army Valery Gerasimov. The plan was put in place on 1 December 2010 and mirrors a proposed reorganisation by former Chief of the General Staff Army General Yuri Baluyevsky for a Regional Command East which was not implemented. The four commands were set up by a decree of President Medvedev on 14 July 2010. In July 2011, an Operational-Strategic Command of Missile-Space Defence has also been established on the basis of the former Special Purpose Command of the Russian Air Force. A Presidential decree of January 2011 named commanders for several of the new organisational structures. Russian security bodies not under the control of the Ministry of Defence include the Internal Troops of the Ministry of Internal Affairs (now the National Guard of Russia's National Guard Forces Command), the Border Guard Service of Russia (part of the Federal Security Service), the Kremlin Regiment and the rest of the Federal Protective Service (Russia), and the Ministry of Emergency Situations, the country's civil defence service since 1995 and successor to earlier civil defence units. Map of naval bases, shipyards and spent fuel storage sites operated by the Northern Fleet. 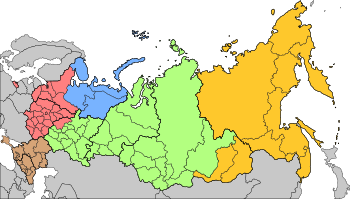 Similarly, the Northeast Group of Troops and Forces, headquartered at Petropavlovsk-Kamchatskiy, comprises all Russian Armed Forces components in the Kamchatka Krai and the Chukotka Autonomous Okrug [district] and is subordinate to the Commander Pacific Fleet headquartered in Vladivostok. 2015 Victory Day Parade in Moscow. Airborne Troops on tactical exercises "Slavic Brotherhood 2018"
Conscription is still used in Russia; the term of service being 12 months; and eligible age is between 18 and 33 years old. Deferments are provided to undergraduate and graduate students, men solely supporting disabled relatives, parents of at least two children and — upon Presidential proclamation — to some employees of military-oriented enterprises. Men holding a Ph.D., as well as sons and brothers of servicemen killed or disabled during their military service, are released from conscription. 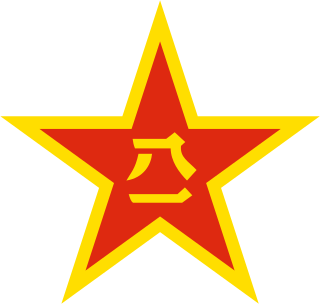 There were widespread problems with hazing in the Army, known as dedovshchina, where first-year draftees are bullied by second-year draftees, a practice that appeared in its current form after the change to a two-year service term in 1967. According to Anna Politkovskaya, in 2002, "a complete battalion, more than five hundred men, had been killed not by enemy fire but by beatings". To combat this problem, a new decree was signed in March 2007, which cut the conscription service term from 24 to 18 months. The term was cut further to one year on 1 January 2008. Thirty percent of Russian Armed Forces' personnel were contract servicemen at the end of 2005. For the foreseeable future, the Armed Forces will be a mixed contract/conscript force. The Russian Armed Forces need to maintain a mobilization reserve to have manning resources capable of reinforcing the permanent readiness forces if the permanent readiness forces cannot deter or suppress an armed conflict on their own. Professional soldiers now outnumber their conscript counterparts in the Russian Army for the first time in Russian history, Defence Minister Sergei Shoigu told Russian media 28 April 2015. Nearly 400,000 contractors serve in Russian army in March 2019. According to Defence Minister Sergei Shoigu, in every regiment and brigade, two battalions are formed by contractors, while one is formed by recruits, who are not involved in combat missions. Currently, there are 136 tactical battalion groups in the armed forces formed by contractors. The ranks of the Russian military are also open to non-Russian citizens of the Commonwealth of Independent States, of which Russia is the largest member. By December 2003, the Russian parliament had approved a law in principle to permit the Armed Forces to employ foreign nationals on contract by offering them Russian citizenship after several years service yet, up to 2010, foreigners could only serve in Russia's armed forces after getting a Russian passport. Under a 2010 Defence Ministry plan, foreigners without dual citizenship would be able to sign up for five-year contracts and will be eligible for Russian citizenship after serving three years. The change could open the way for CIS citizens to get fast-track Russian citizenship, and counter the effects of Russia's demographic crisis on its army recruitment. Each soldier in duty receives an Identity Card of the Russian Armed Forces. On 17 November 2011, General Nikolai Makarov said that Russia had reached a crisis in the conscript service where there simply were not sufficient able bodied men to draft and was forced to halve its conscription. Military draft dodging declined 66% since 2012 and as of March 2019. It is reported that about 80% of the young people who were drafted into the ranks of the Russian Armed Forces in the autumn of 2018 were found fit for military service. According to the head of the mobilization, in recent years, the fitness of future recruits has increased by 7%. In March 2013, Defence Minister Shoigu promised that all army quarters would have showers by the end of the year. RIA also said that the shower plans were the latest in a series of creature-comfort improvements the Defence Ministry had recently announced. In mid-January, Shoigu said he would rid the army of its antiquated "footwraps," or portyanki, and a few days later the designer of Russia's new army uniform said that the ear-flap hats traditionally worn in winter would be replaced with more modern headgear. The Russian military’s ushanka hats were improved between 2013 and 2015, when the Russian armed forces were being equipped with new uniforms. The new version of the traditional - and somewhat stereotypical - hat features better heat insulation and longer ear flaps. Russian military officers with top secret security clearance are now being issued domestically-developed, ultra-secure, cryptographically protected Atlas M-663S cellphones, Russia's Izvestia newspaper has reported in early 2018. A new uniform for hot climates was introduced in mid-2018. In the early 2000s, defence spending increased by at least a minimum of one-third year-on-year, leading to overall defence expenditure almost quadrupling over the past six years, and according to Finance Minister Alexei Kudrin, this rate is to be sustained through 2010. Official government military spending for 2005 was US $32.4 billion, though various sources, have estimated Russia's military expenditures to be considerably higher than the reported amount. Estimating Russian military expenditure is beset with difficulty; the annual IISS Military Balance has underscored the problem numerous times within its section on Russia. The IISS Military Balance comments - 'By simple observation..[the military budget] would appear to be lower than is suggested by the size of the armed forces or the structure of the military-industrial complex, and thus neither of the figures is particularly useful for comparative analysis'. By some estimates, overall Russian defence expenditure is now at the second highest in the world after the USA. According to Alexander Kanshin, Chairman of the Public Chamber of Russia on affairs of veterans, military personnel, and their families, the Russian military is losing up to US$13 billion to corruption every year. However, later that month, due to the world financial crisis, the Russian Parliament's Defence Committee stated that the Russian defence budget would instead be slashed by 15 percent, from $40 billion to $34 billion, with further cuts to come. On 5 May 2009, First Deputy Prime Minister Sergei Ivanov said that the defence budget for 2009 will be 1.3 trillion rubles (US$39.4 billion). 322 billion rubles are allocated to purchase weapons, and the rest of the fund will be spent on construction, fuel storage and food supply. According to the head of the Defence Committee of the State Duma Vladimir Komoyedov, Russia plans to spend 101.15 billion rubles on nuclear weapons in 2013-2015. "The budget provisions under 'The Nuclear Weapons Complex' section in 2013-2015 will amount to 29.28 billion rubles, 33.3 billion rubles and 38.57 billion rubles respectively," Komoyedov said, Vechernaya Moskva reports. Komoyedov added that in 2012 the spending on nuclear weapons made up 27.4 billion rubles. The draft law "On the Federal Budget for 2013 and for the planning period of 2014 and 2015" will be discussed in the first reading on 19 October 2012, The Voice of Russia reports. In a meeting in Sochi in November 2013, President Putin said the country's defence budget will reach 2.3 trillion roubles, stressing the huge amount in comparison to the 2003 budget, which stood on 600 billion rubles. The Russian government's published 2014 military budget is about 2.49 trillion rubles (approximately US$69.3 billion), the fourth largest in the world behind the US, China and Saudi Arabia. The official budget is set to rise to 3.03 trillion rubles (approximately US$83.7 billion) in 2015, and 3.36 trillion rubles (approximately US$93.9 billion) in 2016. As of 2014, Russia's military budget is higher than any other European nation, and approximately 1/7th (14 percent) of the US military budget. In 2015, SIPRI found that Russia was the world's second biggest exporter of major weapons for the period 2010-14, increasing exports by 37 per cent. India, China and Algeria accounted for almost 60 percent of total Russian exports. Asia and Oceania received 66 percent of Russian arms exports in 2010–14, Africa 12 percent and the Middle East 10 percent. In 2017, Russia was reported to have slashed its defense spending by 20%, due to calls by Vladimir Putin to spend Russian money on other initiatives such as healthcare and education. The cut decreased Russia's military spending to $66.3 billion, in which Russia slumped to being the fourth-highest spender on its military. About 70 percent of the former Soviet Union's defence industries are located in the Russian Federation. Many defence firms have been privatised; some have developed significant partnerships with firms in other countries. The recent steps towards modernization of the Armed Forces have been made possible by Russia's economic resurgence based on oil and gas revenues as well a strengthening of its own domestic market. Currently, the military is in the middle of a major equipment upgrade, with the government in the process of spending about $200 billion (what equals to about $400 billion in PPP dollars) on development and production of military equipment between 2006-2015 under the State Armament Programme for 2007-2015 (GPV — госпрограмма вооружения). Mainly as a result of lessons learned during the August War, the State Armament Programme for 2011-2020 was launched in December 2010. Prime Minister Putin announced that 20-21.5 trillion rubles (over $650 billion) will be allocated to purchase new hardware in the next 10 years. The aim is to have a growth of 30% of modern equipment in the army, navy and air force by 2015, and of 70% by 2020. In some categories, the proportion of new weapon systems will reach 80% or even 100%. At this point, the Russian MoD plans to purchase, among others, up to 250 ICBMs, 800 aircraft, 1,200 helicopters, 44 submarines, 36 frigates, 28 corvettes, 18 cruisers, 24 destroyers, 6 aircraft carriers, and 62 air defence battalions. Several existing types will be upgraded. The share of modern and advanced weapons in some branches of the Russian Armed Forces currently amounts over 60 percent, the Defence Ministry reported 31 July 2015. In total since 2012 and as of 2017, the Armed Forces received more than 30,000 units of new and modernized weapons and equipment, including more than 50 warships, 1,300 aircraft, over 1,800 drones, 4,700 tanks and armored combat vehicles compared to two warships, 151 aircraft and 217 tanks received in 2007-2011. The Russian army also receives 150-250 aircraft per year and over 300 short-range UAVs. The Russian Federation is also producing drones (including combat and kamikaze ones) and EW systems to counter them, unmanned vehicles, exoskeletons and military robots. As of 2011, Russia's chief military prosecutor said that 20 percent of the defence budget was being stolen or defrauded yearly. In 2018, RF Armed Forces adopted 35 types of weapons and military equipment and completed state tests of 21 more. The Russian Ministry of Defence (MoD) was procured the YeSU TZ (Yedinaya Sistema Upravleniya Takticheskogo Zvena) battlefield management system that same year. The YeSU TZ battlefield management system incorporates 11 subsystems that control artillery, electronic warfare systems, ground vehicles, air defence assets, engineering equipment, and logistics support, among other things. 12 missile regiments have been rearmed with Yars ICBMs, 10 missile brigades with Iskander tactical ballistic missile systems, 13 aviation regiments with MiG-31BM, Su-35S, Su-30SM, and Su-34 combat aircraft, three army aviation brigades and six helicopter regiments with Mi-28N and Ka-52 combat helicopters, 20 surface-to-air missile (SAM) regiments with S-400 Triumf SAM systems, 23 batteries with Pantsir-S self-propelled anti-aircraft gun-missile systems, and 17 batteries with Bal and Bastion mobile coastal defence missile systems [MCDMSs] since 2012 and as of March 2019. Land-based immobile (silos), like R-36 and its replacement RS-28 Sarmat. Because of international awareness of the danger that Russian nuclear technology might fall into the hands of terrorists or rogue officers who it was feared might want to use nuclear weapons to threaten or attack other countries, the Federal government of the United States and many other countries provided considerable financial assistance to the Russian nuclear forces in the early 1990s. Many friendly countries gave huge amounts of money in lieu for Russian Arms purchase deals which kept Russian Agencies functioning. This money went in part to finance decommissioning of warheads under international agreements, such the Cooperative Threat Reduction programme, but also to improve security and personnel training in Russian nuclear facilities. ^ Masters, Jonathan (28 September 2015). "The Russian Military". Council on Foreign Relations. Archived from the original on 17 September 2017. Retrieved 17 August 2017: This source cites the IISS Military Balance for 2014. ^ International, Sputnik. "Russian Armed Forces Ordered to Increase Manpower to 1.9 Mln Personnel in July". Archived from the original on 21 May 2017. Retrieved 1 May 2017. ^ "Putin beefs up number of troops in military to nearly 2 mln". TASS. 29 March 2017. Archived from the original on 11 July 2017. Retrieved 17 August 2017. ^ News, Pravda. "Putin increases size of Russian army". Archived from the original on 5 May 2017. Retrieved 1 May 2017. ^ Khodarenok, Mikhail (30 March 2017). "Why is Putin expanding Russia's armed forces to 1.9 million?". Gazeta.ru. Archived from the original on 7 September 2017. Retrieved 17 August 2017 – via rbth.com. ^ China, New. "Putin orders Russian Armed Forces staff increase to 1.9 mln". Archived from the original on 1 April 2017. Retrieved 1 May 2017. ^ Security, Global. "Russian Military Personnel". Archived from the original on 9 May 2017. Retrieved 1 May 2017. ^ "The Global Intelligence Files". wikileaks.org. Archived from the original on 2 April 2015. Retrieved 1 April 2015. IISS listed total reserves as 20,000,000 for many years, assuming a Soviet-style callup. The potential reserve personnel of Russia may be as high as 20 million, depending on how the figures are counted. ^ Firepower, Global. "Russian Military Strength". Archived from the original on 22 March 2017. Retrieved 9 April 2017. ^ Telegraph, The (2015). "How Vladimir Putin's military firepower compares to the West". Archived from the original on 18 May 2017. Retrieved 4 May 2017. ^ "Commentary: Asia's rising demand for arms will boost China and US defence markets". Channel NewsAsia. Archived from the original on 26 October 2018. Retrieved 26 October 2018. ^ "766,055". RIA Novosti. 31 October 2013. Archived from the original on 14 April 2017. Retrieved 13 April 2017 – via russiandefpolicy.blog. ^ Министерство обороны России подвело итоги 2016 года [Russian Ministry of Defence summary for 2016] (in Russian). bmpd.livejournal.com. 23 December 2016. Archived from the original on 5 April 2017. Retrieved 5 April 2017. ^ Perlo-Freeman, Sam; Aude Fleurant; Pieter Wezeman; Siemon Wezeman (April 2016). "Trends in World Military Expenditure, 2015" (PDF). Stockholm International Peace Research Institute. Archived from the original (PDF) on 20 April 2016. Retrieved 23 August 2016. ^ Россия вышла на третье место в мире по объему военных расходов, оттеснив Саудовскую Аравию Archived 24 April 2017 at the Wayback Machine NEWSru, 24 April 2017. ^ "Putin holds single day of military products' acceptance, modern weapons share up to 70%". TASS. 16 July 2015. Archived from the original on 14 April 2017. Retrieved 14 April 2017. ^ "Almost 60% of Russian Armed Forces Armed With Advanced Weapons - General Staff". Sputniknews.com. 23 March 2017. Archived from the original on 19 June 2017. Retrieved 27 May 2017. ^ For an account of this period, see Odom, William E. (1998). The Collapse of the Soviet Military. Yale University Press. ISBN 0-300-07469-7. ^ For some early discussion on this period, see Richard Woff, "A Russian Army", Jane's Intelligence Review, May 1992, 198-200. See also Voenniy vestnik No 12, 1991. ^ "Short life of the new Russian Guard". Tsiganok.ru. 21 December 2006. Retrieved 24 March 2014. ^ Министерство обороны Российской Федерации [Ministry of Defence of the Russian Federation] (in Russian). Politika.su. Archived from the original on 21 December 2012. Retrieved 24 March 2014. 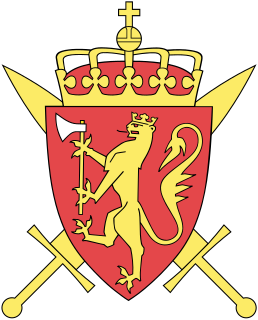 ^ The Staff for Coordinating Military Cooperation was established as the CIS Joint Armed Forces High Command in March 1992 and then reorganised as the Coordinating Staff in August 1993. It quickly became a very weak body as the new states' authorities asserted their control over their own armed forces. (Russia and NIS Mineral Industry Handbook, International Business Publications, 2007.) Army General Vladimir Yakovlev (general) appears to have become Chief of the Staff in June 2001 (DS2002-0819). ^ Parchomenko, Walter (Winter 1999–2000). "The State of Russia's Armed Forces and Military Reform". Parameters: the U.S. Army's senior professional journal. ssi.armywarcollege.edu: 98–110. ISSN 0031-1723. Archived from the original on 10 December 2016. Retrieved 17 August 2017. ^ "Russia's top brass gather in Moscow to discuss military reform". En.rian.ru. 2 September 2009. Archived from the original on 3 September 2009. Retrieved 24 March 2014. ^ "Russia to Boost Defense Spending 59% by 2015". RIA Novosti. 17 October 2012. Archived from the original on 1 January 2013. Retrieved 23 March 2014. 'Targeted national defense spending as a percentage of GDP will amount to 3.2 percent in 2013, 3.4 percent in 2014 and 3.7 percent in 2015,' Defense Committee chairman Vladimir Komoedov is quoted as saying in the committee's conclusion on the draft budget for 2013-2015. ^ a b "Reform of the Russian Armed Forces". En.rian.ru. Archived from the original on 22 January 2012. Retrieved 24 March 2014. ^ "16.01.12 Реформа ВС РФ повысила эффективность авиации — командир авиагруппы ВВС — Военный паритет". Militaryparitet.com. Archived from the original on 23 March 2014. Retrieved 23 March 2014. ^ Wallace, Andrew (27 May 2010). "New military command structure and outsourcing initiatives". THE ISCIP ANALYST (Russian Federation) An Analytical Review. Boston University. XVI (13). Archived from the original on 21 October 2012. ^ Golts, Alexsander (20 July 2010). "3 Heads are worse than one". The Moscow Times. Archived from the original on 22 July 2010. ^ "Russia sets up four strategic commands". RIA Novosti. 14 July 2010. Archived from the original on 16 July 2010. ^ "Russia's regional military commands". RIA Novosti. September 2010. Archived from the original on 6 December 2011. ^ Кадровые изменения в Вооружённых Силах [Staffing changes in the Armed Forces] (in Russian). Presidential Administration of Russia. 9 January 2011. Archived from the original on 12 January 2011. Retrieved 23 March 2014. ^ "Strategic C3I Facilities". globalsecurity.org. 2000. Archived from the original on 12 January 2003. ^ Politkovskaya, Anna (2007). Putin's Russia: Life in a Failing Democracy. Henry Holt and Company. p. 2. ISBN 978-1-4299-3915-7. ^ "History of Russian Armed Forces started with biggest military redeployment ever". Pravda. 7 May 2007. Archived from the original on 12 May 2007. ^ Giles, Keir (2006). Where have all the soldiers gone? : Russia's military plans versus demographic reality (PDF). Conflict Studies Research Centre. ISBN 978-1-905058-92-1. Retrieved 14 April 2017: Explores some of the challenges of the March 2007 transition to the new approach to deployment. ^ "Recruitment: New Personnel Policy". Russian Ministry of Defence Official Website. Archived from the original on 23 August 2006. ^ "Russian Army: Contract Soldiers Outnumber Conscripts First Time in History". Sputniknews.com. 28 April 2015. Archived from the original on 14 April 2017. Retrieved 14 April 2017. ^ "Azeris attracted to serve in Russian army." BBC Worldwide Monitoring. (Originally in the Azerbaijani paper Echo.) 14 March 2005. (Via Lexis-Nexis, 27 July 2005). ^ Okorokova, Lidia (25 November 2010). "Russia's new Foreign Legion". The Moscow News. Archived from the original on 17 July 2011. Retrieved 24 March 2014. ^ "Now you can join the 'Russian Foreign Legion'". info-wars.org. 29 November 2010. Archived from the original on 14 November 2011. ^ "Russian military has 'no one left to draft'". RIA Novosti. 17 November 2011. Archived from the original on 5 April 2015 – via globalsecurity.org. ^ "Russian Defense Chief Promises Soldiers Showers by Year End". RIA.ru. 4 February 2013. Archived from the original on 11 October 2016. Retrieved 18 May 2014. ^ Sputnik. "Call of Duty: Russian Army's Tough, Ultra-Secure Phone Will Make You Freak". sputniknews.com. Archived from the original on 21 June 2018. Retrieved 21 April 2018. ^ Austin, Greg; Alexey Muraviev (2000). The Armed Forces of Russia in Asia. London, New York: I.B. Tauris. p. 155. ISBN 1-86064-485-6. ^ FBIS: Informatsionno-Analiticheskoye Agentstvo Marketing i Konsalting, 14 March 2006, "Russia: Assessment, Adm Baltin Interview, Opinion Poll on State of Armed Forces". ^ "Russian defense budget may rise 25% in 2009". USA Today. Associated Press. 19 September 2008. Archived from the original on 20 September 2008. ^ "Russia boosts defense budget to record $50 Billion". Turkish Daily News. 12 September 2008. Archived from the original on 19 September 2008. ^ Leander Schaerlaeckens, "Russian budget cuts could impact EU defense market" Archived 4 May 2009 at the Wayback Machine, UPI (23 February 2009). ^ "Russia to spend over 100 billion on nuclear weapons". English.pravda.ru. 18 October 2012. Archived from the original on 18 October 2012. Retrieved 23 March 2014. ^ "Russian defence ministry's budget in 2013 to reach 2 trl and 300 bln roubles". ITAR-TASS. 29 November 2013. Archived from the original on 1 December 2013. Retrieved 30 November 2013. ^ "Russia to Up Nuclear Weapons Spending 50% by 2016". RIA Novosti. 8 October 2013. Archived from the original on 8 October 2013. Retrieved 1 March 2014. ^ Harding, Luke; Traynor, Ian (8 February 2007). "Big rise in Russian military spending raises fears of new challenge to west". The Guardian. Archived from the original on 16 October 2013. ^ Rusakova, Tatyana (13 January 2016). "What's new with the Russian army?". RBTH. Archived from the original on 11 October 2017. Retrieved 30 August 2017. ^ "Ballerinas, puppets inspire names of Russian arms". RBTH. 4 September 2013. Archived from the original on 11 October 2017. Retrieved 30 August 2017. ^ Litovkin, Nikolai (14 September 2016). "Army 2016 forum: Top 8 newest Russian weapons". RBTH. Archived from the original on 11 October 2017. Retrieved 3 September 2017. ^ Egorov, Boris (12 July 2017). "A farewell to traditional arms: Russia develops weapons for the future". RBTH. Archived from the original on 9 September 2017. Retrieved 3 September 2017. ^ "Russia's Air Force to get 20 heavy transport planes by 2020 (adds)". Itar-tass.com. 1 August 2011. Archived from the original on 27 July 2012. Retrieved 23 March 2014. ^ "Share of Modern, Advanced Weapons Over 60% in Some Russian Branches". Sputniknews.com. 31 July 2015. Archived from the original on 14 April 2017. Retrieved 13 April 2017. ^ "Russian Forces Receive 40 Arms Carriers, 180 Long-Range Cruise Missiles in 2016". Sputniknews.com. 24 May 2017. Archived from the original on 18 August 2017. Retrieved 17 August 2017. ^ Litovkin, Nikolai (9 August 2017). "'Comrade in Arms': Russia is developing a freethinking war machine". RBTH. Archived from the original on 9 August 2017. Retrieved 3 September 2017. ^ Egorov, Boris (6 June 2017). "Rise of the Machines: A look at Russia's latest combat robots". RBTH. Archived from the original on 3 October 2017. Retrieved 3 September 2017. ^ "Is Terminator back? Russians make major advances in artificial intelligence". RBTH. 10 February 2016. Archived from the original on 11 October 2017. Retrieved 20 September 2017. ^ "Virtual trainer for robots and drones developed in Russia". TASS. 15 May 2017. Archived from the original on 11 October 2017. Retrieved 3 September 2017. ^ Faulconbridge, Guy (24 May 2011). "Russia says a fifth of defense budget stolen". Reuters. Archived from the original on 14 April 2017. Retrieved 13 April 2017. ^ "Nuclear Weapons: Who Has What at a Glance". Armscontrol.org. January 2017. Archived from the original on 24 January 2018. Retrieved 13 April 2017. ^ "Президент России". kremlin.ru. Archived from the original on 20 February 2011. Retrieved 1 April 2015. "The United States leads upward trend in arms exports, Asian and Gulf states arms imports up, says SIPRI". Stockholm International Peace Research Institute, SIPRI. 16 March 2015. Retrieved 13 April 2017. Что такое современная армия России [What is the modern army of Russia]. Vlast (in Russian). Kommersant (7(610)). 21 February 2005. Archived from the original on 14 November 2007. Retrieved 20 September 2008. The Armed Forces of Azerbaijan were re-established according to the Law of the Republic of Azerbaijan on the Armed Forces from 9 October 1991. The Azerbaijan Democratic Republic (ADR) had originally formed its own armed forces from 26 June 1918. However these were dissolved after Azerbaijan was absorbed into the Soviet Union as the Azerbaijan Soviet Socialist Republic from 28 April 1920. After the Soviet Union dissolved in 1991–92 the armed forces were reformed based on Soviet bases and equipment left on Azeri soil. The Armed Forces of Armenia comprise two services: the Army, and the Air Force and Air Defense. Though it was partially formed out of the former Soviet Army forces stationed in the Armenian SSR, the military of Armenia can be traced back to the founding of the First Republic of Armenia in 1918. Being a landlocked country, Armenia has no navy. The Korean People's Army is an institution of the Workers' Party of Korea, and constitutes the de facto military forces of North Korea. Under the Songun policy, it is the central institution of North Korean community. Kim Jong-un is its Supreme Commander and the Chairman of the Central Military Commission. The KPA consists of five branches: Ground Force, the Navy, the Air Force, the Strategic Rocket Forces, and the Special Operation Force. The Strategic Missile Forces or Strategic Rocket Forces of the Russian Federation or RVSN RF are a military branch of the Russian Armed Forces that controls Russia's land-based intercontinental ballistic missiles (ICBMs). The RVSN was first formed in the Soviet Armed Forces, and when the USSR collapsed in December 1991, it effectively changed its name from the Soviet to the Russian Strategic Rocket Forces or Strategic Missile Troops. The Russian Space Forces are a branch of the Russian Aerospace Forces, that provides aerospace warning, air sovereignty, and protection for Russia. Having been reestablished following the 1 August 2015 merger between the Russian Air Force and the Russian Aerospace Defence Forces after a 2011 dissolving of the branch. The Russian Space Forces were originally formed on the 10 August 1992 and the creation of the Russian Armed Forces. The organisation shared control of the Baikonur Cosmodrome with the Russian Federal Space Agency. It also operated the Plesetsk and the Svobodny Cosmodromes. However the Russian Space Forces were dissolved in July 1997 and incorporated into the Strategic Missile Troops. The General Staff of the Armed Forces of the Russian Federation is the military staff of the Armed Forces of the Russian Federation. It is the central organ of the Armed Forces Administration and oversees operational management of the armed forces under the Russian Ministry of Defence. 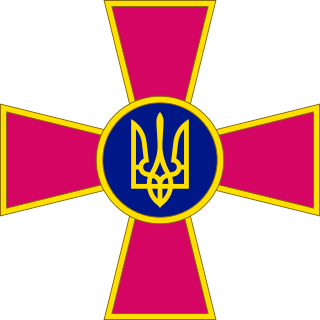 The Ministry of Defence of Ukraine was established on 24 September 1991, one month after Ukraine's declaration of independence resolution. The ministry was in charge of all Soviet military forces reorganization on the territory of Ukrainian jurisdiction. The Aerospace Defence Forces Branch, short: ASDFB (Russian: Войска воздушно-космической обороны, tr. Voyska vozdushno-kosmicheskoy oborony was a branch of the Armed Forces of the Russian Federation responsible for aerospace defence, and the operation of Russian military satellites and the Plesetsk Cosmodrome. 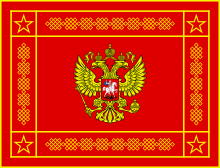 It was established on the 1 December 2011 and replaced the Russian Space Forces. The ASDFB was first commanded by former Space Forces commander Colonel General Oleg Ostapenko, who was promoted to Deputy Minister of Defence in November 2012. On 24 December 2012, Aleksandr Golovko was appointed the new commander. Although it is officially translated as aerospace in English, it covers both attacks from the air and from space, and some Russian writers translate it as "air and space" instead. Voronezh radars are the current generation of Russian early-warning radar, providing long distance monitoring of airspace against ballistic missile attack and aircraft monitoring. The first radar, in Lekhtusi near St Petersburg, became operational in 2009. There is a plan to replace older radars with the Voronezh by 2020.